De vakantiewoning is een van de drie vakantiewoningen die op een verhoging achter het bijbehorende hotel (O Sole Mio) liggen. Er mag ook gebruik worden gemaakt van het buiten zwembad van het hotel. Rondom het huis ligt een mooie ruime tuin met veel privacy. Huis zelf is van alle gemakken voorzien (alleen de keuken is niet heel erg ruim voorzien van pannen, etc). Locatie is erg geschikt voor verkenning van de kust onder Napels van Pompei tot Salerno, waarbij dagtochten naar eilanden zoals Capri ook zeer goed mogelijk zijn. Dichterbij ligt op loopafstand het dorp Sant Agata Sui Due Golfi met leuke restaurantjes en een aantal kleine winkeltjes. It was the most relaxing holiday we have ever had. We will never forget it …We spent two wonderful weeks in this comfortable, clean and nicely furnished cottage. The swimming pool is amazing! We also enjoyed dining outside the patio. We often went to have a nice espresso at the cafes near in the town of Sant’Agata. We were able to relax and to go sightseeing as well, we had the chance to visit lovely Sorrento, Positano and Amalfi. Would definitely recommend it! We will surely come back. Best place to stay in Sorrento Coast! My parents and my boyfriend and I stayed here for a week and had a wonderful time! The owner was so helpful he organised a day trip to Capri for us and cooked pizzas for everyone another night. It was such a lovely place to stay. The house was lovely too as were the surrounds and pool which was beautiful! Would definitely stay here again!! Superb villa ideal for a young family with one or two children and to use as a base to explore Sorrento and Amalfi coasts.. There are two villas within the grounds of a hotel each with their own secluded garden. Hosts very friendly on arrival. Lovely pool area which when we stayed in June was empty, we had it to ourselves. The hotel itself looked very inviting and looked to have a very good menu, although we did not experience this during our stay preferring to self-cater. The villa is a short 10 minute walk into the village of St Agata which has several shops selling all the supplies you will need plus cafes, restaurants all very family friendly. Local buses run into Sorrento from the town as well, very convenient - although very busy at peak times - journey takes approx. 20 minutes. The villa itself was very clean. It has two large ensuite bedrooms and a small kitchen diner ideal for preparing small meals. There is a microwave style oven which does actually grill and crisp small items. Free wifi. There is a hardware store in town where you can purchase barbeques and briquettes. My only comment would be that there is no washing machine - yet a dishwasher, we only stayed a week so managed but any longer and you would need one especially if having kids. Our stay was most enjoyable and our 3 year old is asking when she can return. 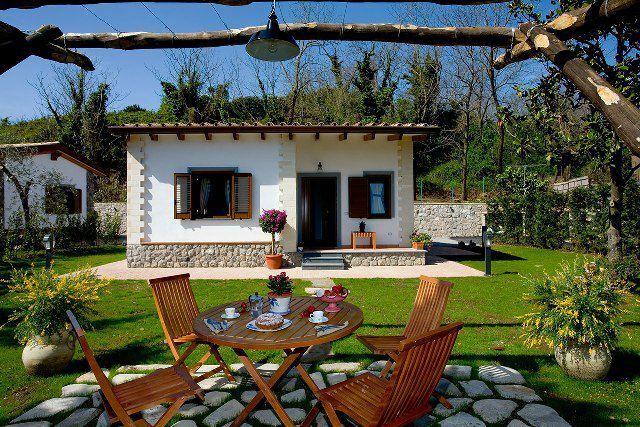 Beautiful little cottage situated less than 10 minutes walk from a lovely authentic Italian village and only 20 minutes drive from the centre of Sorrento. The cottage was perfect for our needs, with plenty of space to cater for us all (2 couples and very energetic toddler). The hospitality that was shown by Carmen and Tony made this holiday extremely special. I would highly recommend this property. We had a totally wonderful time here. We did a lot of exploring and loved returning to our own little cottage, reading relaxing and eating out on the terrace. Although we had a car we enjoyed walking into Sant'Agata, had fun trying out the bus and even took the ferry from Sorrento to Capri for the day. We used the hotel swimming pool nearby quite a few times which was welcome to cool off as it was pretty hot whilst we were there. The cottage was very comfortable, had air conditioning and the name Oasis truly describes this lovely spot. We found the local people very friendly and the agency La Bella Toscana obviously know their stuff and were very helpful with our many questions during booking. Le tasse di soggiorno indicate sono al giorno per persona.